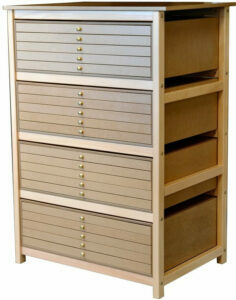 The Chest of Drawers comprises a wide range of drawers modules, each including between 2 and 8 drawers. They are reversible and modular, with 13 modules to choose from. Each module offers drawers of different sizes and depths, which means you can adapt the unit to a particular use. 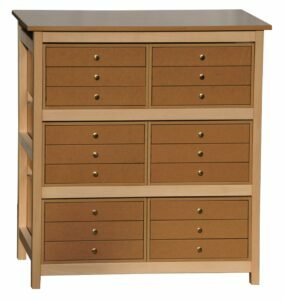 The Chest of drawers is available in three sizes: two, three and four levels. Its sober and elegant design allows to integrate the Chest of Drawers in different styles of interiors, in museums, galleries, bookstores, shops, at photographers. Configured with drawer modules n°3, the Chest of Drawers is similar to plan chest or architect drawers. It can indeed be arranged with 10, 15 or 20 drawers of internal formats of 60 x 80 cm (Traditional French format called "Soleil", bigger than the "Raisin" (50 x 65 cm) or "Jesus" (56 x 76) formats) and therefore accommodate a considerable number of sheets and papers. This configuration also allows the storage, in a rational way, of old engravings, lithographs, photos. In addition to the optimized storage of papers, each activity of manual work and creative leisure can find with the Chest of Drawers the appropriate organization. Arranged with many small drawers, the Chest of drawers will be similar to the haberdashery; we find the crazy charm of craft furniture. Collectors will also find this furniture solution for storing various objects from their collections. The Chest of Drawers can be arranged, such as adding a tilting top plate to transform it into a lectern presentation, have its depth decreased, be positioned on a tray with casters ... (see tab "option"). On request, some drawers modules can also be set up to receive collections of insects: butterflies, beetles ; entomologists, lepidopterists, do not hesitate to contact us! 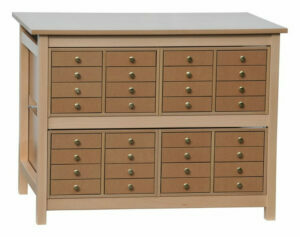 Furniture's structure and drawers belt in solid beech. Worktop shelves, modules of drawers and drawers fronts in MDF. See other products "Collectionneurs / Graphics arts / Storage units "